My fingers touch something wet. I hold them there for a moment, feeling the water on my skin, the haze of sleep slowing my mind. Am I dreaming? Then I bolt upright, fully awake. The enemy is through the gate. A single thought blares through me like an alarm. I yank my sleeping bag into the air, holding it above the water pooling inside my tent. Two pounds of down, nylon, and zipper. It is the last piece of equipment that stands between me and death. It is the one thing I must keep dry above all others, above all the pawns, rooks, knights, and bishops. It is the king. Water drips off the bag’s edges where it slipped over my sleeping pad and into the pool. I feel it with my fingers to make sure it isn’t bad, just a bit wet, not enough to worry. A down sleeping bag isn’t the Wicked Witch of the West. A few drops will not kill it, but get it soaked and what could keep you alive in a snowbank will be as useless as thin sheet. I pull out a plastic trash bag and shove the king inside. This is no time for formalities. We are under siege. I throw my electronics with him, each of them already wrapped in plastic and safe, then I sit on the two-inches of inflatable sleeping pad to think. It’s 3AM and the solid ground I was sleeping on has turned into a pool of mud and water too deep for my tent floor to hold back. Water spills in like an army across a broken castle wall. Everything on the floor is soaked. Backpack, socks, food bag, half my clothes, the bottom of the sleeping pad. I think back to when I picked the campsite. I knew it would rain, but I wasn’t expecting the pool. I thought the water would drain. Or did I? Did I think about it at all or was I just focused on dinner and my tired ankle? Was I just happy for flat ground? No, I must have thought about it. I always think. Or did I? I shove the thoughts away. It’s a mistake at the end of a long day and it doesn’t matter. The pool of water matters now. I can’t stop it. I can only retreat. I stick my head outside. The rain has stopped and I want to just stay put, hope it will drain away, but the sky is dark and I know the rain will be back. I know I can’t stay. I know I have to deal with this problem now. That’s always how it is our here. You can’t put off problems. They only grow. I yank everything outside. I find a higher patch of ground and move the wet tent, dumping as much water out as I can before setting it up again. It’s humid and soaked inside, but there is no where else to go at 3AM so I get in, carefully unwrap the king over the dry side of the mattress, and fall back asleep as the rain returns. In the morning I wrap the king in a plastic bag then shove it all into a water resistant stuff sack. That goes in another plastic bag that holds everything in my pack. Outside that, I slip a cover over the pack. I set off under dark skies. Rain catches me fast, never leaving for long as I walk. I find little overhangs of rock to hide in and steal a few dry moments, but mostly I just walk, up and down passes as the rain batters away at me and the walls built around my king. When I feel cold I think him, hidden well, deep behind walls of fabric and plastic, layer after layer, and I know that I can always get warm again. The thought is almost as important as the reality. The rain falls, hard and heavy. It seeps through my jacket. It soaks my pants. It runs down my nose and through my beard. I choose my campsite carefully this time, picking out a piece of high ground near a lake. I pitch the tent tight during a break in the rain and dive inside as the next storm rolls overhead. I open my pack, open the layers around the king until I pull out the beautiful, dry, lofty down, and curl underneath it, feeling warm and secure as I drift to sleep. Posted in Europe North to SouthTagged backpacking, ENS, Europe North to South, featured, hiking, rain, tents, thru-hikingBookmark the permalink. Oh boy, you seem to be in the belly of the whale. Love your spirit and writing. Here’s to a break in the rain. D: I have always felt the way you described it. Very nicely said. That King, that psychological and real King, must stay dry above all else. Hope the coming fall brings drier weather. Hoping for a few sunny days to dry you out and raise your spirits. Seems like it has been raining on you for weeks. 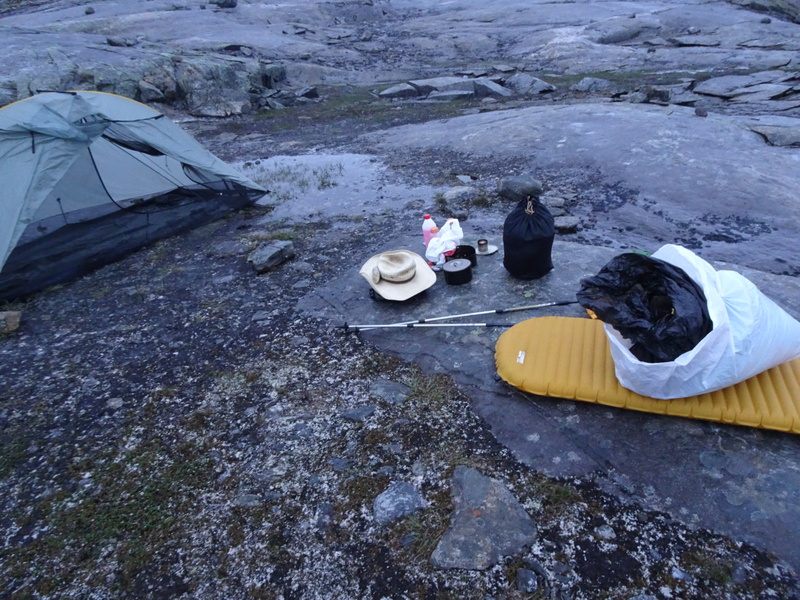 Keep the “king’ dry…..
OMG I do hate rain getting into the tent when you are sleeping! You have my great admiration for salvaging the situation and soldiering on. Here’s hoping for good weather ahead.